Before I knew it, Christmas is only a few days away. If you are like me and tend to do last minute shopping, here's an app that would make a great gift for your juniors or other parents. It's a storybook appropriately called Don't Open Before Christmas although honestly it is an enjoyable read all year round. Don't Open Before Christmas is a charming story about a boy who learns about patience the hard way. On the night before Christmas, when his parents were away, an 8-year-old boy named Seymour impatiently opens his presents even when he has been told not to. He forgets that presents are like eggs; they need time to hatch just right. If you open them too soon, you'll never know what you get! As a consequence of his actions, Seymour must now deal with wild mutant presents zipping and zinging about. They are making a mess and Seymour with the help of his cute puppy must rewrap them before his parents get home. It's not an easy task given that the rampaging gifts are too fast to catch! Fortunately though, Seymour discovers that the presents calm down at the sound of music. Using wrapping paper rolls, he constructs a musical instrument and plays a lullaby to lure the presents back into their boxes. Seymour then wraps them up and put them back under the tree. The next day, after learning what Seymour has done, his parents make him wait a bit longer to open his presents. He doesn't mind, though. In the end, Seymour gets his properly hatched presents and a very valuable lesson -- sometimes waiting is the only way to get what you really want. The app has a well-written plot, tight and amusing in a way that reminds readers of classic cartoons. 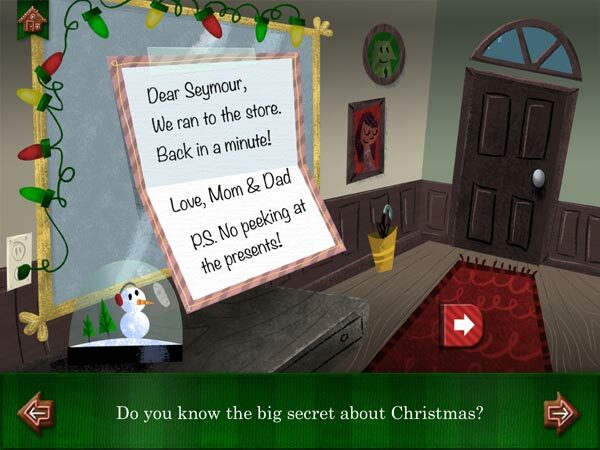 Don't Open Before Christmas is an endearing storybook app that teaches juniors the value of patience through a humorous plot. Aimed at younger juniors, the app makes use of relatively simple narration and colorful visuals to keep readers engaged. The app is fully interactive, with plenty of hidden easter eggs in every page. There are also pull-tabs and rotating dials that trigger additional text or narration as well as amusing sound effects and animations. Like most digital storybooks, Don't Open Before Christmas comes with two reading modes, Read by Myself or Read to Me. The latter features an excellent narration; clear, emotive and engaging to listen to. Unfortunately, there is no option to replay the audio or tap on words to hear them read aloud. In addition to the default English, the app supports five languages: Spanish, French, Portuguese, German and Dutch. However, the Read to Me feature is only available in English for now. Each page is full of interactive tidbits; pull a tab to reveal a hidden scene, rotate a dial to move the characters around and so on. I thoroughly enjoyed reading Don't Open Before Christmas. The story of a boy who tries to round up a bunch of misbehaving toys before his parents get home is amusing and a great nod to classic cartoons. I appreciate the well-written and tight plot as many storybook apps surprisingly lack this quality. Visually, the app is an eye candy with its bright and colorful illustrations that come to live with clever use of animations. There seems to be plenty of interactions in every page and I enjoy pulling on tabs or rotating dials to see what is going to come up next. A favorite scene of mine is the one where you can see all the rooms in Seymour's house. Pulling on the tab next to each room will change to show its condition after the toys wrecked havoc there. Another fun page is the one where Seymour constructs a musical instrument from wrapping paper rolls. In addition of listening to Seymour play, you can also create your own tunes by tapping on the rolls. If I had to nitpick, one flaw that I would point out is that the app has an uncommon page turn animation. Instead of curling from right to left like in most storybooks, the pages of the app move from left to right when I tap on the next (right) arrow. This confused me at first as I thought that I had moved to the previous page instead of the next. Not a pressing issue, but irksome nonetheless. 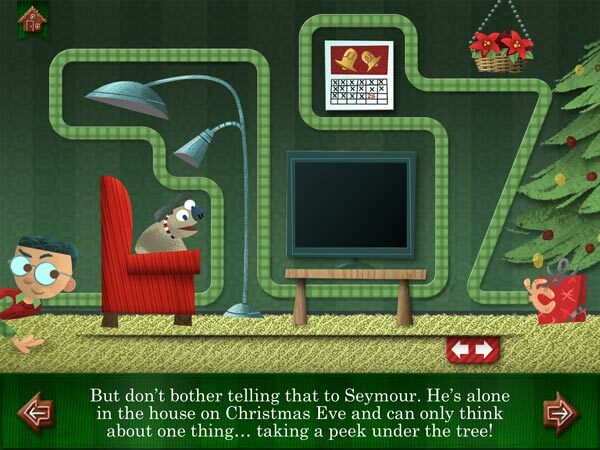 You can even play music with Seymour and his pup! Instead of like, perhaps I should say that I love Don't Open Before Christmas. It's a charming app that has the complete package and despite its title, you certainly can (and is encouraged to) try the app before Christmas. If you are looking for an app to give to others or even yourself, Don't Open Before Christmas is a great candidate.